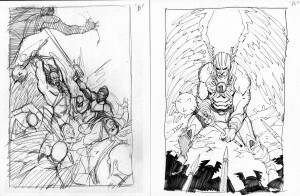 Here we are again with another cover process breakdown. 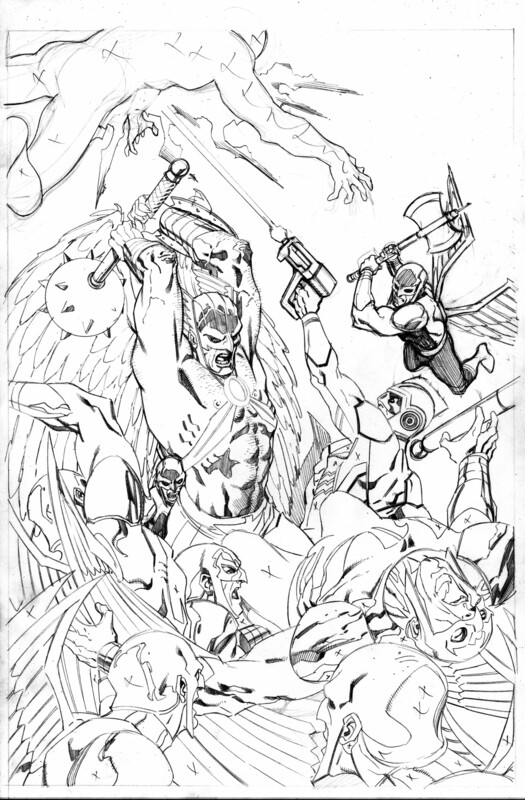 Since I did my first two Hawkman/Adam Strange covers the name of the mini-series has been officially changed to the ominous, “Death of Hawkman featuring Adam Strange.” No matter what you call it, it’s the same series and here is how the cover to the 3rd issue came about. As I look through my files it appears that I only came up with 2 sketches for this cover. 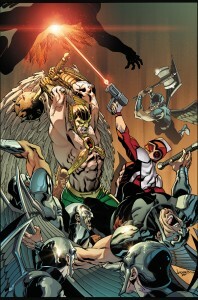 I knew I wanted to feature Hawkman on this cover since the previous cover featured Adam Strange. 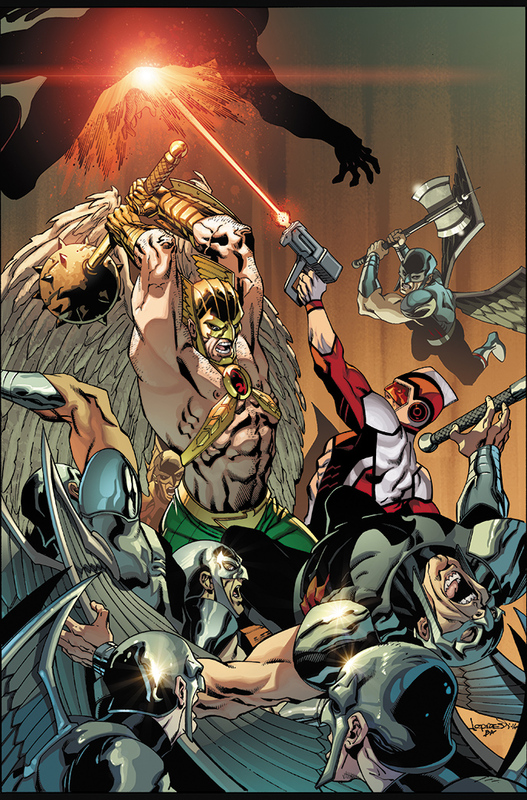 Although, Adam Strange is a serious player in this series, Hawkman is a much more popular character and the title is “The Death of Hawkman”, so it makes sense he should be featured as much as possible. The first one and the best one was chosen so I took it to pencils. 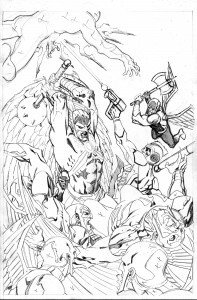 You’ll notice I changed the positioning of Adam Strange on the cover. 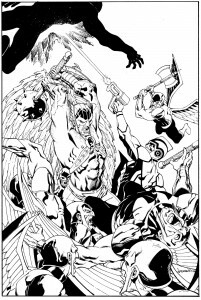 I really wanted this to be a Hawkman cover so I used Adam Strange’s left arm as his gun arm so it would come up and cover part of his face. He’s still there but very much a secondary player. You’ll also notice the pencils are very tight and clean. This is because as I drew the piece I made enough alterations through the drawing process that I felt the paper was too soiled. So I light tabled the original drawing onto this board and then added whatever details were necessary to complete the piece. After finishing this clean pencil drawing I inked it with a brush. Through recent years I have been experimenting with a combination of brush and pen, constantly searching for a look I like. A few months ago I decided to stick with a brush and really refine my approach. I’m really pleased with the direction I’m going as I am finally finding that balance between achieving slick control and a lively organic feel. Since I have the most awesome Brad Anderson available for coloring these covers I have gladly stepped aside and allowed him to do some nice work. So what you see below is Brad’s coloring for the final cover. I’m feeling really good about these covers and I have just finished the fourth one. I will post about it as soon as I can. So until then….